Uncover the mysteries of the past with this exciting, comprehensive guide on world history. History books are often filled with long descriptions, complex facts, and stories that can bore even the most enthusiastic history buffs. In World History 101 you’ll skip those tedious details and focus on engaging lessons that will impress any kind of historian. From Julius Caesar and Genghis Khan to the Cold War and globalization, each section takes you on an adventure through time to discover the most important moments in history and how they shaped civilization today. 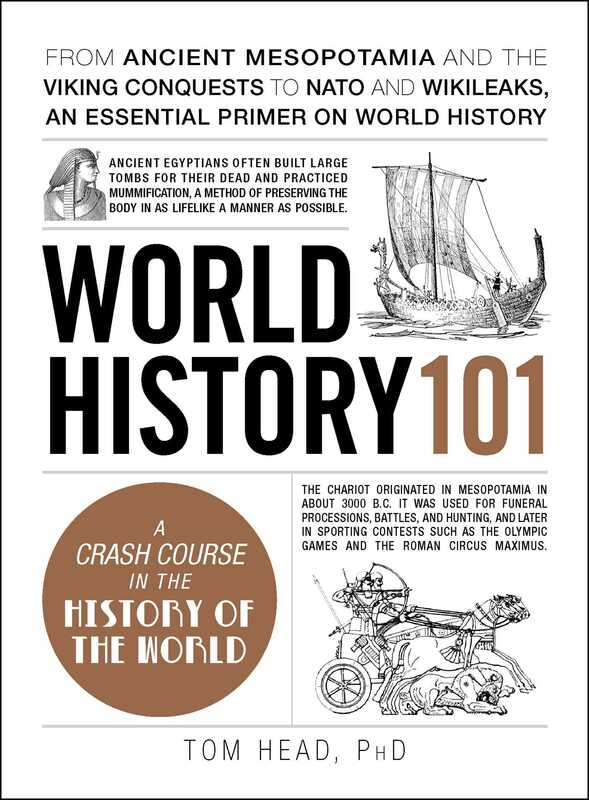 With hundreds of absorbing facts and trivia throughout, World History 101 can help you learn more about the civilizations of the past and help bring history to life. Tom Head is an interdisciplinary historian who specializes in the history of religion, ethics, and ideas. He holds a PhD in religion and society from Edith Cowan University and is author or coauthor of twenty-nine nonfiction books on a wide range of topics, including Oneworld’s Civil Liberties: A Beginner’s Guide, the University Press of Mississippi’s Conversations with Carl Sagan, and Que/Pearson’s The Absolute Beginner’s Guide to the Bible, and Adams Media’s World History 101. He served for nine years as About.com’s guide to civil liberties, and currently writes videos on philosophy and pop culture for Wisecrack, LLC, a popular YouTube channel with over 1.5 million subscribers and over 125 million views.